Castle Combe is a quintessentially English village. It is set in the Cotswolds Area of Outstanding Natural Beauty in North West Wiltshire.The lower part of the village was protected by a 12th century Castle. It was a Motte and Bailey designed Castle. The Castle was built by the de Dunstanville family during the wars of Stephen in about 1140. The Barony and the Castle- This is an area of land held as a contract with rights and duties. The family resided in the Castle for several generations. In the end the Castle was based on a Barony – since this was an adminstrative division of the county. The village was built around the Market Cross with the old water pump beside it. Standing crosses were used within settlements probably as places for preaching, public proclamation or penance. This one is well- preserved and an unusually fine example of a late medieval market cross.Thus it is a monument of considerable local importance. Most of all reflecting the significance of the cloth industry in this area. Close to the Market Cross is the remains of the Buttercross. It was called a Buttercross due to the fact that they were located at the market place, where people from neighbouring villages would gather to buy locally produced butter, milk and eggs. The church was originally founded in the 13th Century. The building has been extended over a long period of time. Most of the church is from the 15th Century because this tied into the prosperity of the local wool and cloth trade. The 15th Century faceless clock in the church is well worth examining as it is one of the oldest working clocks in the country. Sir Walter de Duntansville is the Knight resting in the church. His feet are crossed ( indicating that he fought in the Crusades) and resting on a lion. Also he has his hands on his sword suggesting that he died in battle. The main high street leading down to the By Brook river. 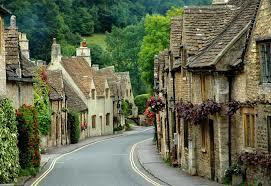 The superb Cotswold buildings owe their presence to the prosperous period as a weaving town. The Weavers’ cottages are still evident. A red and white cloth was produced by the weavers. You may be tempted with homemade cakes, sweets and bunches of local flowers as you wend your way down to the By Brook river. It is by the river that you can look back up at the beautiful main high street. Famous Films using Castle Combe as a setting. 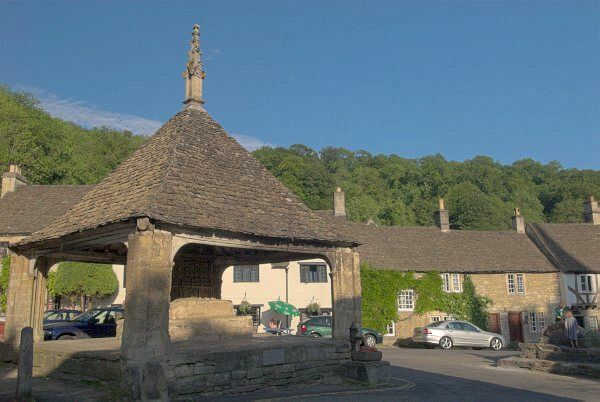 The sheer beauty of the village has attracted film makers from far and wide.The original Dr Doolittle film used Castle Combe as the fictional Puddleby – on -the – Marsh in the 1960’s film with Rex Harrison. The Wolfman and Stardust has also used the village as a back drop. Most noteworthy Stephen Speilberg’s War Horse was recently filmed here.